As noted, Dolph Ziggler has hinted at vacating the U.S. title on SmackDown Live. On a recent episode of the Conversation With The Big Guy podcast, Ryback weighed in on Ziggler's current WWE status. "I personally think he should take a little break. I think he deserves a break," Ryback said. "Whether he resigns or not I think he should take some time off, at least 6 months. I want to see him in the Bahamas just drinking. I say take a year off. He is still young enough." Ziggler won the U.S. championship this past Sunday at Clash Of Champions, but on Tuesday's SmackDown Live he appeared to relinquish the title. It has been reported that Ziggler will be off TV for a few weeks, so it is not yet known what the plans are for him and the U.S. title. Ryback said not re-signing with the WWE was the best decision he could've made, so he would advise Ziggler to do the same. "I'm a big believer--when I left, and it was under different reasons, but when I left it was the best decision I had ever made because it allowed me to address my health that I put off for a long time, and physically I am in such a better place. 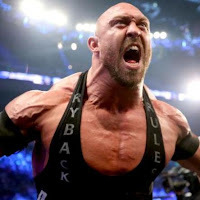 No doubt in my mind that if I had stayed and re-signed the contract and given in to everything, I bet you my career would have been over after another year there," Ryback said. "I would have had to of had back surgery. My back would have been done because I didn't get MRI's when I was there because I didn't know how bad I was, which is a very hard-headed thing to do, but not everyone was necessarily like that, but you don't want to know how bad you are f***ing up your body. Again, it was one move that really did me in, which was that back-pack stunner, but I didn't know that, and I wouldn't have known that had I not done the MRI's and spoken to those who know about it. I feel that now I have a new body because of it at 36 because I took time off for different reasons, which was the best thing for me. I look healthy, lost a little weight, and I got to chill out, work out for three hours. Being that heavy takes a toll on you. I naturally have to train heavy, which I got to dial down on that and not train as heavy this year so that everything can heal up." As one of the longest tenured superstars on the WWE roster, Ziggler has dealt with multiple start-and-stop pushes throughout his career. Ryback said it might be time for him to see what else is out there for him because the grass might be greener somewhere else. "When you are there for quite some time it's okay to take a little break, whatever your reasons are. I always say that you work so hard in life and that everyone wants to talk about the grind, but you have to enjoy life," Ryback said. "What is the point of making money if you can't enjoy it? You are going to get to a point when you are 50 and realize you missed out on your best years. Not to say that you have years ahead of you, but stepping away and getting out of the bubble will open your eyes and see the light that is out there. There is always ways to make money and wrestling is always going to be there."